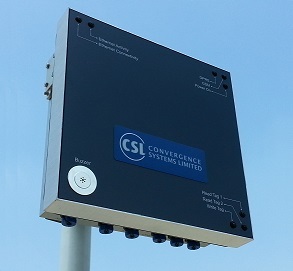 HONG KONG — March 26, 2014 — Today, Convergence Systems Limited (CSL), a global provider of passive RFID products and active RTLS equipment, announced availability of the CS208-3G RFID fixed reader. The CS208-3G continues CSL’s tradition of reliable RFID technology, adding 3G connectivity with high powered antenna to the CS208 platform to create the first truly intelligent integrated reader with an embedded edge server. The CS208-3G integrated reader is ideally suited to stationary check in/check out asset management applications, as well as large area continuous scanning solutions in access control, event management, and inventory management. This intelligent reader is being used in conjunction with the CS9010 Battery Assisted Passive (BAP) ID card for a high-security child tracking solution. The BAP ID card, which can be read consistently and reliably when hanging from the neck or embedded in a wallet, backpack or purse, is tracked by the CS208-3G fixed reader, which then sends a wireless confirmation message to mobile devices to provide peace of mind for parents and school officials. “The CS208-3G has given Infinium a significant ROI proposition for providing seamless mobile or fixed network connectivity in harsh operating environments like oil and gas, mining, logistics, mobile people tracking and defense,” says Vimal Shah, project director of Infinium Solutions. Best of breed circular polarized antenna performance with excellent axial ratio.